I am no longer running tours of Mexico because of pressing family problems (aging parent). I hope to be able to start again in a few years. Meanwhile, please enjoy the photos and stories. You might enjoy Mexico Without Fear, a website for my book that will be coming out in the fall. MexAdventures lets you experience the reality of Mexico through a series of outdoor and cultural adventures. The Chiapas tours offer you an authentic look at a beautiful state with a spring-like climate, lush landscape, and well-preserved Mayan ruins where the large indigenous population still values its formidable history. Sherry Hardage has traveled throughout Mexico and lived in several cities. San Cristóbal de las Casas is a favorite. She has designed tours to give you cultural insights and an appreciation for history and the future of Mexico. You'll get many chances to photograph wildlife, an opportunity to climb the tallest pyramid in Mexico, and plenty of time to explore a delightful Pueblo Magico city on your own. Let her share with you her love of this region, its history, and the delightful, friendly Mexicans! MexAdventures does not set up tours and then try to fill them with random people. We schedule tours for groups from 6 to 10 individuals who generally know each other through associations, churches, clubs, internet interest groups, or who are members of an extended family. If these tours interest you, please contact Sherry and she can help you organize a trip for your family or group. Trips can be modified to fit the group's interest, and to incorporate more (or fewer) archeological sites, nature preserves, hiking and caves, or museums and villages. Take a tour of San Cristóbal de las Casas, and Chiapas! On the two-week tour we will boat down the Cañon del Sumidero, travel in a circle around the eastern half of the state, and spend several informative days in San Cristóbal de las Casas. Chiapas is Mexico's off-the-beaten-path treasure, filled with natural beauty, ancient history, lively people and livelier music. It is the birthplace of the cocoa bean, the avocado, and the marimba. Our adventure will include cave exploration, hiking in forests and jungles, wildlife in natural habitats, interesting rides on boats and in packed public buses. You will see Mexico the way it really is, on the ground, not from the window of a tour bus! This 7-day circle tour of Chiapas starts and stops in San Cristóbal de las Casas. We will explore 5 Mayan city-state ruins, the waterfalls of Agua Azul and Misol Há, spend two nights in the jungle along the Lacantún River at a preserve for the Scarlet Macaw, and photograph the lovely colored lakes of Lagunas de Montebello. You can climb pyramids, photograph wildlife and explore a beautiful Pueblo Magico city, Comitán. This tour can be scheduled anytime during the dry season, from January through June except the week before Easter. If you are a birder, photographer, or amateur archeologist, you might be interested in a custom tour for your family or group. Chiapas is full of opportunities for wildlife viewing and photography, and there are many more Mayan ruins than are commonly visited. MexAdventures contracts with private professional drivers with vans and 4x4 vehicles. We can take you anywhere you'd like to go. Read through the available tour descriptions, and contact us if you would prefer a customized tour to fit your interests. 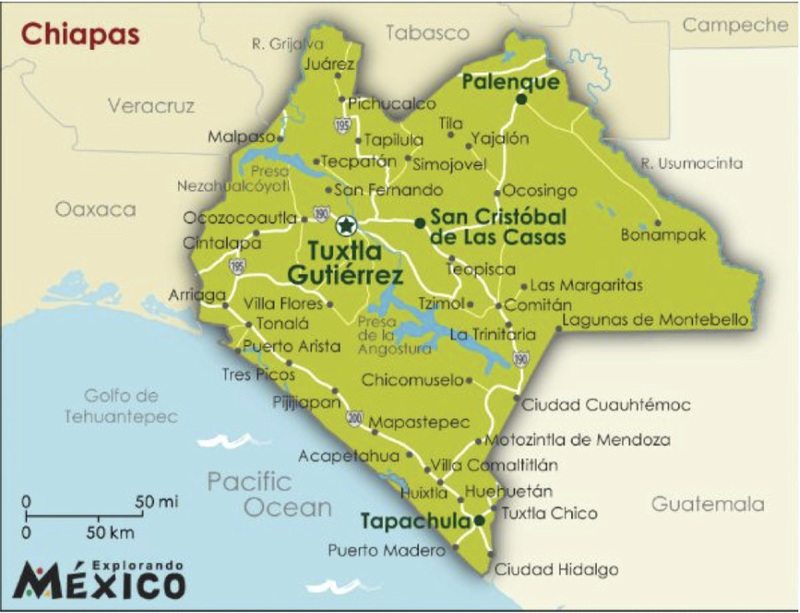 Map of Chiapas. Our tour focuses on the eastern side of the state.